If you’re a working artist or you’d like to be one, chances are you spend quite a bit of time thinking about SPACE. Not the space that’s really, really big and that we’re all rushing through at 574,585 miles per hour. No. The type of space you have all to yourself, to make art in, to make mess, to think and to feel like, well, you know – a PROPER artist! I’ve come to the conclusion that space to create in is more important than time, materials or even ideas to an artist. Many of us have limited time to spend on art – and certainly no long stretches of time to devote to it, as perhaps we’d ideally like to. The awesome thing with having a creative space is, you can work for ten minutes and then leave it, knowing it will be undisturbed and you can come back next time you have ten minutes, or more. No having to pack away materials, it’s all just ready for you when you need it. Now, these days I am a lucky girl and I have a little yellow room all of my very own, complete with creative cushion nest in one corner and a nice big desk on which to make things. Here I am, me in my yellow room making something! But it wasn’t always that way. Sure, I’ve prioritised studio space when I could, but even so it’s not always possible. I’ve shared a very cold old warehouse/garage with two other artists (no loo, no running water, no heat in the winter, lots of spiders) and I’ve converted a garage at home into a painting space (more spiders). At other times, I’ve simply not had the money to rent anywhere, or the space to commandeer somewhere at home. In my little flat I had before this home, I came up with a cunning solution. I went SMALL with my work, mainly journalling and mail art and the like, and used a writing desk. It cost me just £5 at the local waste recycling centre! Using this lovely piece of furniture meant everything was in one place and easy to stash away when I was done. I also had a little bit of a Jane Austen feeling every time I sat down. Mind you, Jane Austen had neither a room of her own (she shared with her sister), or even a writing desk. 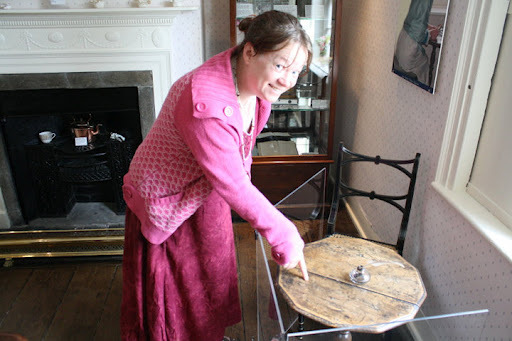 This is me, touching the ACTUAL TABLE she wrote at, at Jane Austen’s house museum in Chawton. Squeeeeeeeeeeeeeeee! Did I mention Jane Austen actually LIVED IN SOUTHAMPTON for a bit?! I’ve also used cunning storage boxes, so that materials can be easily got at, and fold out tables. I’ve sometimes just had a sketching kit in a handy bag with a sketch book and a few drawing things. 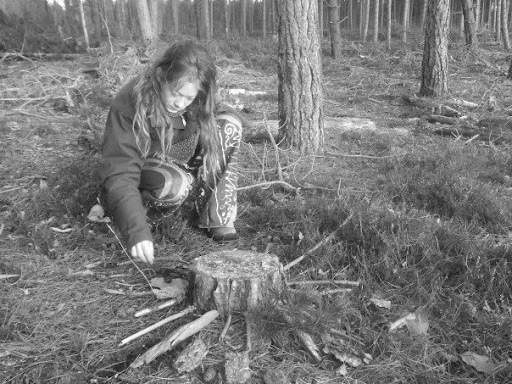 The most radical way I dealt with this was the move to land art. 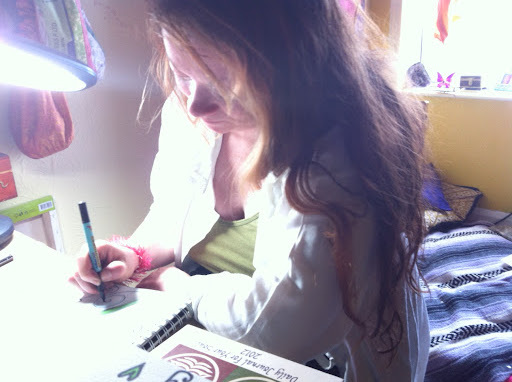 This medium meant the outside world became my studio and natural things I found became my materials. All I needed was a camera and somewhere to upload pictures. Very few of us will have the opportunity to have the studio one sees in the movies (you know, the huge loft space with kitchen and a mattress on the floor in one corner and us sitting all tortured and arty in the middle of a big pile of canvasses). In addition, it’s worth considering whether a studio away from home is best for you, as you always need to make a special trip to go and work there. My experience of an out-of-home studio was that it was great when you needed to forget the outside world and focus, but I didn’t go there more than a few times a month. Unit11 Studios, Tower House and The Arches Studios. If there are any others, I hope somebody will tell us about them as we get quite a few people contacting us about studio space! The concept of a ‘Jelly’ co-working event can be adapted to suit creative people. We have one at The Art House, every Wednesday afternoon. People come along with laptops, sketchbooks, notebooks etc and work together in the same space. Not quite the same as a permanent studio space (we can dream) but it still gives you the chance to work with others at least for a few hours. This would be relatively easy for ANY artist to arrange in their home town, even once a month. Many pubs and cafes have quiet times when they’d welcome a regular group. Or, you could even meet at a library – many libraries also have free meeting rooms for use (Southampton Central library does). Friendly local cafes are a big resource for any artist, giving you a space where you can work away from the distractions at home for the price of a few cups of coffee (don’t forget to order Fair Trade!). It’s one of the reasons I was so passionate about founding our little arts cafe and it gives me a massive thrill to see art actually being created here. This entry was posted in Tutorials, advice, how-to. Bookmark the permalink. 1 Response to So, you want an art studio?